Chicken has never tasted better! 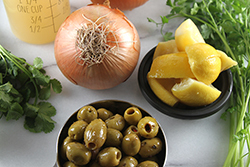 The secret to this piquant dish is the briny essence from the preserved lemons and the salty green olives. The chicken pieces are first treated to an herbed spice rub, then is cooked to tenderness slowly while bathed in a rich, spice-infused broth. 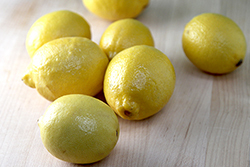 (See the recipe for preserved lemons below.) You’ll love the result! 1. 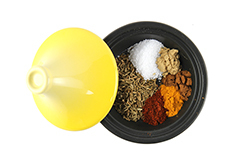 Mix the rub ingredients together in a small bowl until combined. Rub all over the chicken pieces, and refrigerate for 1-4 hours. 2. On the stovetop in a large tagine (or Dutch oven), combine the 2 tbsp butter and 2 tbsp olive oil and melt over medium heat. Brown the chicken pieces on all sides. 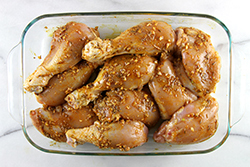 Remove the browned chicken pieces from the tagine, and set aside on a plate while the sauce is assembled. 3. 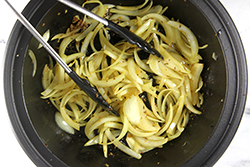 Add the onions to the pot and sauté until translucent. 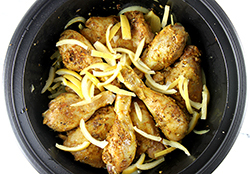 Place the chicken back into the pot, add the sliced lemons rinds, and pour in broth. Cover with the tagine lid, and turn the heat to low. 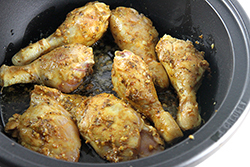 Simmer the chicken for 45-60 minutes or until the chicken is cooked through and reaching an internal temperature of 165° F.
4. Add the green olives, simmer until warmed. Serve hot over couscous or rice. Generously garnish with the cilantro and parsley. Preserved lemons are a staple of North African cuisine, and are now making their way all over the world as a wonderful secret ingredient. 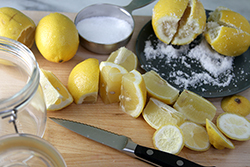 To preserve, fresh lemons are pickled in a brine of salt and their own juice. 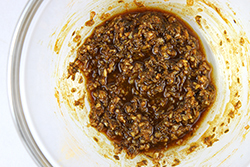 The result is a condiment that tantalizes both the sour and salty taste buds. 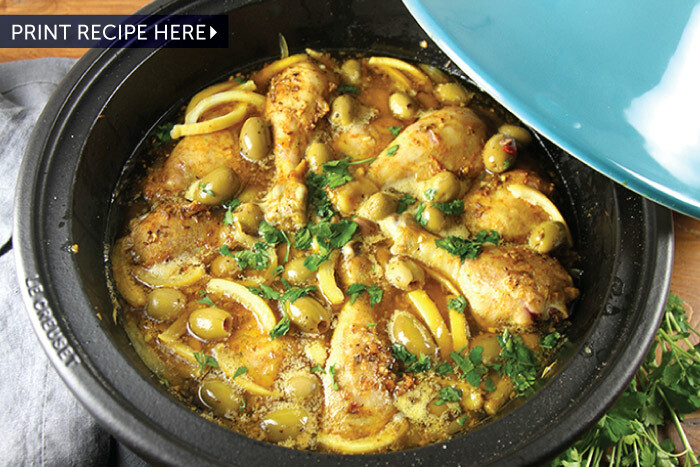 Add slices of lemon to dishes like this braised chicken, pasta dishes, or as a salad garnish. 1. 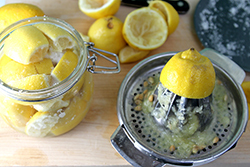 Choose a jar with a tight fitting lid large enough to hold the desired quantity of lemons. Prepare the jar by filling with boiling water to sterilize. Drain the water from the jar and allow to air dry. 2. Choose lemons that are fresh and unblemished. Scrub the outside with a vegetable brush. 3. With five of the lemons, trim the stem and blossom ends off. Cut the lemons in quarters, pole to pole. 4. Place the kosher salt on small plate. Dredge each quarter in the salt and place in the prepared jar until the jar is filled. Add any remaining salt from the plate to the jar. 5. Squeeze the remaining lemons and fill the jar with the freshly squeezed lemon juice until all of the lemon quarters are covered with juice. (Don’t add water, add only lemon juice to top off the jar). 6. Close the jar with a tight-fitting lid and place in the refrigerator for 30 days. Remove the lemon quarters as needed. 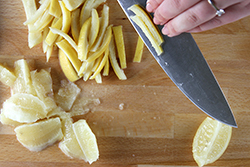 Rinse the pieces, cut out the lemon flesh, then slice rinds into thin slices. 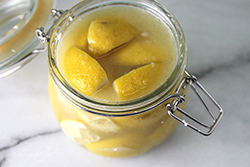 The lemons may be kept in the refrigerator in the brining jar for up to six months.